A beautiful smile can do so much more for a person than simply make them look attractive—it can also fill them with confidence, and with confidence, you can do just about anything. However, if you feel held back by obvious stains, chips, cracks, or gaps in your teeth, Andover Family Dental can make them seemingly disappear with cosmetic dentistry. We’ll help reveal your best smile by providing treatments that both look great and are designed to last a lifetime. Whether you’re interested in a minor touch-up or a complete smile makeover, we can do it for you, and we know you’ll absolutely love the results. To get started, contact us today. Why Choose Andover Family Dentistry for Cosmetic Dentistry? Porcelain veneers have long been a favorite in Hollywood because this one treatment can eliminate multiple cosmetic flaws at the same time. They are extremely thin ceramic coverings that are made to look like perfect white enamel, and they can be fitted right over the front of the teeth to dramatically improve their appearance. Permanent stains, chips, cracks, gaps, and even slightly crooked teeth can all be fixed with porcelain veneers, and better yet, a patient can get them in just two quick appointments. For patients looking for a quick fix for minor stains, chips, or gaps, cosmetic bonding is an effective treatment that only takes an hour or less. Your dentist will apply a color-matched composite resin to your compromised tooth, and then they’ll sculpt it to look like a regular part of the enamel, covering any blemish along the way. This treatment is not only fast, but completely painless as well, plus the results can easily last for a decade or more. As we age, it’s very natural for the teeth to lose their luster and discolor, whether due to coffee, wine, tobacco, or just the passage of time. Fortunately, even the most stubborn stains are no match for our professional-strength whitening treatments. With either Kor Bleaching or Opalescence whitening, we can easily make your smile 6-8 shades brighter without increasing sensitivity. You can get a quick in-office treatment for immediate results, or we can give you your own custom-made kit so you can whiten whenever and wherever you want. 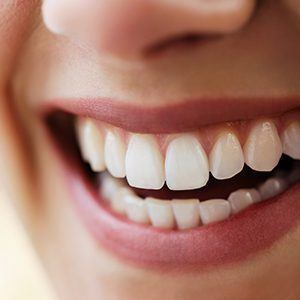 Does your gum line overshadow your teeth whenever you smile, causing them to look too short or stubby? This is a very common problem, and one we can easily fix in just one appointment using our soft tissue laser. With it, we can quickly, painlessly, and precisely remove excess gum tissue to reveal beautiful, previously hidden dental structure underneath. We can then use the laser to shape the new gum line along the teeth to give someone that perfectly balanced look.